There are a lot of interesting glass projects in construction. It’s amazing the number of invitations to bid (ITB) that we receive each month. And when your invitation to bid (ITB) is sent, the first person to see it is our Commercial Project Research Specialist, Deborah Patrick. Deborah came to Crystal Structures in September of 2009. She had previously worked with the Dodge plan rooms so she had a basic understanding of how to use those types of programs to find the right kind of jobs. In fact, the plan rooms are the part of the job she really enjoys. Deborah spends her days browsing through the hundreds of commercial glazing projects listed on ConstructConnect, reviewing invitations to bid and responding to quote requests. Everything starts with the specs of course. After reviewing the specs, the initial criteria Deborah looks for in an invitation to bid (ITB) is the size of the glazing project, the type of glazing (glass or polycarbonate) and the location of the project. It’s rare that we turn down the opportunity to bid on a project. We’re pretty diverse when it comes to specialty architectural glazing: skylights, canopies, greenhouses, glazed structures, even car washes can be made entirely of glass. 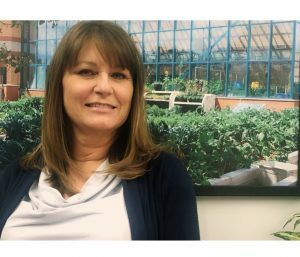 Although she has a hard time naming specific favorites, Deborah says she really likes the types of glazing projects that are in community based buildings, which provides the public with amazing views and really shows off our capabilities. Among the top in her list: Hershey Gardens Atrium, Alabama University Student Center, the canopies at Hampton Inn in Tampa. A lot has changed over the nine years that Deborah has been at Crystal Structures. There have been innovative changes in the types of glass. Now when a glazed structure is completed, the effect is better natural daylighting with less solar heat gain. Many of our projects qualify for LEED certification. And that is also very satisfying, knowing that we are contributing to a sustainable build. If you have an ITB or need a quote on your project, you can contact Deborah directly: 316.838.0033 ext 115 or just send her an email.